We often think of games as recreation for children. However, gaming is a serious learning method in terms of both designing innovations and sharing. This is what we and our Senegalese partners have experimented, with a view to let farmers draft themselves natural resource management policy. 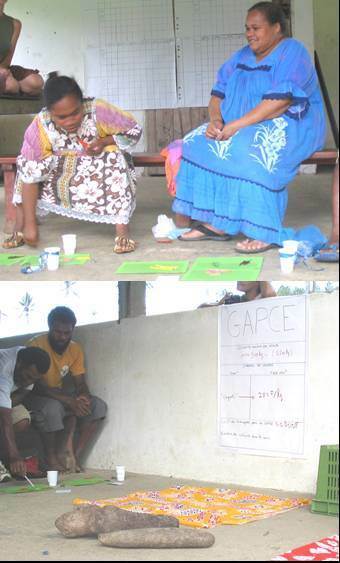 The novel participatory method we used combined role-play and simulation board games. It allowed farmers to design then test their own ideas of relevant innovations, with a view to ensuring sustainable development without any preconceived scientific or political ideas. The objective was to allow local know-how to be expressed, so as to derive original solutions suited to natural resource use in the uncertain climatic conditions of the Sahel. Over five years, a muti-scale participatory platform (from a ComMod approach background) has been tested to help strakeholders in drafting themselves proposals of land policies. By combining role-play and simulation board games, farmers became enabled to test together, by "playing", their ideas for collective rules that would ensure sustainable use of natural resources and land. The platform can now be shared with national policy-makers , in the form of a computer "game" that analyses farmers' proposals and enables the insertion of new ideas. This computer version is also being used directly with farmers. In Senegal, after five years of tests in a range of situations, the platform was transferred to civil society in 2014 in order to help them to confront to the challenge of a new land tenure reform. Six months after, the platform is in widespread use for developing dialogue with the State on land reform policy. The platform let farmers be involved into a mix of game and live theater where they are improvising the situations from their reality they want to better deal with. This first step is crucial to launch a real stakeholders' steering of the process. This is the basement of our approach, and it is implemented before setting more usual experts' inputs and research activities. A movie has been made to stress and explain this important institutional and social dynamics (->see english version, french version). Through this 'self-design' process of policies principles and collective rules, stakeholders are developing high-level exchanges during participatory workshops, which are afterwards synthetised in policies principles during exchanges between farmers and an interdisciplinary group of experts. These 'inner' simulations drive them to set out very original, relevant and endogenous collective principles for the management of natural resources and land access. Then, farmers and civil socety leaders share and bear these ideas with decision makers and authorities. At this stage, the computerizing version of the farmers' role playing game helps to share and co analyze their ideas with decision makers and authorities. These simulation games are the fruit of a decade of interdisciplinary research by specialists in the social sciences, modelling and the environmental sciences (see http://www.commod.org/ and http://ur-green.cirad.fr/). They ensure new forms of dialogue and mutual recognition of farmers' know-how and more generally local scientific knowledge, and policy-makers' know-how. The 2014 experiment is now at the stage of national deliberations. Final results will be published in early 2015. However, results of the previous experiments have already been published (d'Aquino and Bah 2012, d'Aquino et al. 2002). Our first basic principle is: only serve a local commitment. This is the most efficient way to achieve lasting impacts. Whatever the given domain (environmental management, production improvement, value chain organization...), one can find out some local stakeholders' own top priorities and strong motivations of collective mobilisation and of participation for their future. These priorities are not yours? If we frame an open systems approach, whatever the entry point into a system, you will be progressively drived to deal with, because every system element is interacting, the other differents elements, interactions and constraints of the whole system. Consequently, if you let stakeholders first learn to deal with their own priorities, they will end up to yours...if your issues are really priorities for the system. Consequently, our approach is first focus to serve a local commitment towards local top priorities. That means give to the stakeholders the abilities to progress by their own towards the ways to better manage complex issues, through their 'self' use of our simulations supports. Our second basic principle is: mobilising first local knowledge, know-how and experience. Knowledge will be embedded into the inner learning process of management only if and when stakeholders require for (see below the "Research 'After' Development" chapter). The same philosophy of our first basic principle is thus applied: if you let stakeholders first mobilise their own abilities and knowledge, it will end up to require new knowledge, added knowledge...if, or only when, this knowledge is really usefull, at this given step, to improve the self incremental process towards a better management of the system. Our last basic principles: think small, do big. Think small: only aiming the first modest, so workable, but needed progress towards the issue challenge. Do big: about this restrained objective, implement every possible required activity to obtain any practical progress that may be required to affect every key people and institution that play a key role in the chain of changes which results in a lasting change. The strategic dimension odf the approach is crucial to achieve lasting changes from local to global level. The approach must be embedded in existing collective action and institutional dynamics and the one of the first steps focuses on their analyses. Rules of the game are lightly different if used with farmers (which know very well their practices, their background rules and their local environment) or with people who are not the real users of the resources (like experts, public...). A facilitator is needed for the 'villagers' game but not for the 'public' game. The game board required for these simulation games can be easily built. Implementing the Self Land Policies game is the first step which sets the simulation frame, and priority scenarios, from the villagers' point of view. Then, National stakeholders, experts, and scientists points of view (this term is preferred to 'knowledge") can be embedded into this villaggers' frame, and so model, thanks to a computerizing version of the prior model: this is our way to implement a participatory modelling. Regurlarly, the shared momentum materializes every new raised steps of the inclusive process into new very operational tools and methods to empower stakeholders in land and natural resources management policies. A first experiment of this method has been implemented at a local level between 1998 and 2000. A ten-year impact evaluation has been done in 2012. What are the relevant technical ways to preserve water resources ? What are the relevant ways to improve pastures productivity? What are the agriculture assurances posiblities, their advantages and their constraints? In what extent the management principles they tailor may improve the ways we think adaptability and resilience? Which impacts the radical changes in policies devided by stakeholders may have in a economic, environmental and social perspectives? Which law frames may be used to set in, and adapt to, official terms their proposals? Which kind of novel deliberative democracy may be adapted to the ways they suggesst to 'live together'? Approach has been used for other issues (local environmental management, commodity chain approach, water management,...), at local as well river basin or national scales, and in different parts of the world. © Cette page est publiée sous la responsabilité exclusive de Patrick D'AQUINO.